Was curious about the original factory delivered configuration of the 01500/01600 series cars in 1969: The 01500s were originally true single unit MUs with cabs on each end while 01600s were and are pairs. Was this configuration (single units and paired sets) intended to allow odd consists (3, 5 cars) if needed? And were the 01500 single units ever intended for single car operation, such as off-peak and late evening service on the South Shore when low density could have been expected? The South Shore #1 cars 01500-01523 and 01600-01651 were ordered in December 1967 with the first cars arriving in August 1969. As far as I can tell the 01500's (single cars) were never run as single units or to form 3-car trains. I do believe that was the premise for them. I am sure someone will have more detailed info. 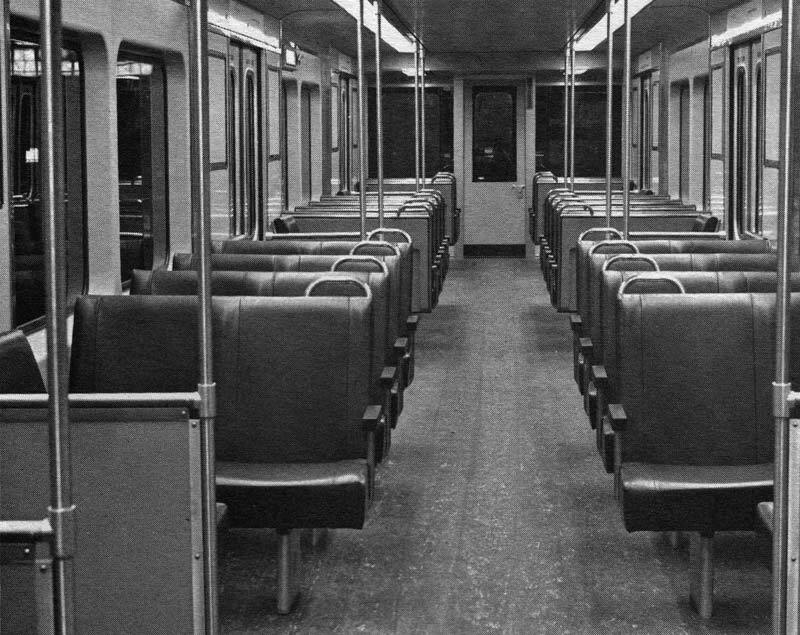 They were purchased for the South Shore Line, and were delivered with commuter style cushioned seats. Park St. at the time was only long enough to accommodate a 5 car train. At that time, all of the heavy rail lines ran 4 cars only during morning and evening rush hours. Off-peak and weekends were 2 car trains. CRail wrote: They were purchased for the South Shore Line, and were delivered with commuter style cushioned seats. Park St. at the time was only long enough to accommodate a 5 car train. So, like what is going to happen with the GLX, the rolling stock arrived well before the extension opened. IIRC in the book ""Change at Park Street Under"" there's a picture of the inside of a 15/16 after delivery. Here are three scans from a document I own. I think they give you what you are looking for. I remember riding them in the early '70s after the line opened. Transverse seating with the cool black leather seats. I heard that they needed 3 upholsterers to keep up with the vandalism on the seats though. Originally the train ran express from North Quincy to Andrew so it was a fast ride as the Columbia then JFK/UMass platform hadn't been built yet. I don't recall ever seeing anything other than 4 cars at peak, 2 cars off peak just like the 01400 trains. This is how they looked in 1972. From The BSRA's South Shore: Quincy-Boston by Bradley H. Clarke. According to the book, the first two were delivered August 6th, 1969, a special trip for dignitaries was run on September 25, and went into revenue service on the Red Line December 11 of 1969.
of ERA's "HEADLIGHTS" (Volume 30-Number 11) titled "Boston-South Shore Car Progress". The article contains two Pullman Standard artist renderings of a single unit car and the interior. won as the low bidder over Canadian Vickers, St. Louis Car and the Budd Company. Two added photos are of 1957 Main Line Elevated cars and East Boston Tunnel cars near Airport. Two other subjects mentioned were "South Cove Tunnel Started" and "Systemwide Fare Revision". The writer was Robert W. Barrows - which is on pages 6-7-8. I have no scanning or picture ability so I included as much search information as possible. The 01500-series cars were presumably ordered as single units because off-peak ridership on the South Shore line was uncertain, given that more than a decade had passed after the closure of Old Colony commuter rail service. To my knowledge they never operated as single cars in revenue service. The PATCO line in New Jersey was being built at the same time and that system also ordered a mix of single-unit cars and married-pair cars so the MBTA may have been using that system as a guide (unlike the T, PATCO did operate single units during times of low ridership). As others have noted, standard operation was 4-car trains during rush hours and 2-car trains at all other times. This was due to the Massachusetts 'guard law' which required one door guard for every 2 cars on MBTA rapid transit trains until it was eliminated in 1980 during the authority's fiscal crisis. Once the law was gone, 4-car trains became the norm at all times. The only time I can recall 01500's being operated as anything other than a married-pair was a brief time in the early 1980's when the T tried operated several 5-car trains on the Red Line during rush hour. All of the stations from Andrew to Park Street were long enough to accommodate five cars so the trains operated Braintree-Park Street only, with a printed card sign in the front since there was no 'PARK ST.' reading on the Silverbird rollsigns at the time. This operation did not last long due to the disruption it caused in turning trains at the Park street crossover.